It was the most vague invitation I have ever received. Unpredictable factors, like winds, weather, and where the reindeer have wandered make the logistics of the Sami calf marking event a mysterious affair until the last second. For a second summer in a row, I’ve been working as a field assistant on a hydrology project 200 km north of the Arctic Circle in Sweden. My job revolves around catching rain events, so I have grown used to living day-to-day based on the weather. However, when I started looking into obtaining permission to observe the centuries-old tradition where the Sami round up their reindeer and mark the newborn calves, I had to reach a new level of flexibility. Working in the Swedish Lappland has been incredible. The beauty of fjällen [rough translation: Northern mountains] is indescribable, and the scientific research station I’m based at is at the heart of a hiking wonderland, surrounded by protected National Parks. A step out the door, and you can immerse yourself in ‘wilderness.’ However, the nature around here is not untouched. The Sami people have been living and herding reindeer in Northern Sweden for centuries. 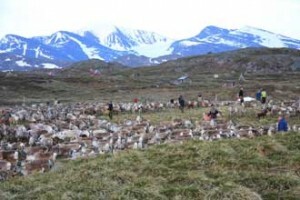 Though major changes have taken place with the use of new technologies, reindeer husbandry continues to be a way of life and a source of income for many Sami families. While they no longer follow the reindeer as they move up and down the mountains with the seasons, the Sami still have camps in the mountains where they spend a couple of weeks every summer to round up and mark the calves born in the spring. Though the reindeer roam free, they are owned by the Sami. The fact that they roam freely means that rounding them up is quite the challenge and explains why no clear date and time can be predicted for the event. Since the Sami family I had been in touch with was going to be waiting in the mountains, I had to be in contact with the helicopter pad to know when the calf marking would occur. It wasn’t until just hours before that they knew it was time. My friend, Frida, and I hitched a helicopter ride with a Sami father and his daughter, eager to head up and see by how much their herd had grown. The daughter was also learning to lasso, so that she could continue on her family’s tradition. The helicopter dropped us off somewhere deep in the snow-capped mountains, where Sami families sat around their individual campfires, waiting. The setting was incredible: the true Swedish fjäll with tundra vegetation, patches of snow, a small lake, and the contrasting jagged peaks of Norway in view. The father-daughter duo invited Frida and I to their fire. There they shared with us their homemade smoked reindeer meat and laughed at the sausages we’d brought from the store. In exchange for the reindeer meat, we offered Dutch cheese and maple syrup, staples of our respective countries. As we waited for the helicopters and four wheelers to herd the reindeer into the corral, our new friends shared openly about their tradition and the ways in which it has changed over the years. Of course, we also talked about popular TV shows, fashion in America and Europe, and the new Twitter craze. The underlying feeling, however, was definitely one of eager excitement. Frida likened it to waiting for Santa Claus, and the moment when we first spotted the stampede of reindeer pour over the mountainside was at least as strong as a child’s Christmas morning rush. Once the reindeer were in the corral, we had to wait until the oldest Sami entered before everyone else could follow. In the meantime, our new Sami friends sharpened their knives and stretched their lassos, getting ready for a long night of work. Finally, we could enter. What a feeling it was to stand amongst at least one thousand running beasts! The sight was unbelievable, but even more shocking was the constant, almost frog-like, sounds that the mothers and calves made as they called out to each other and ran around in chaos. Soon, the family that had originally given Frida and I permission to attend the calfmarking found us inside the corral. Snapping our cameras like the paparazzi, we were not hard to single out. The grandmother introduced us to her almost-two-year old granddaughter, who was stumbling around amongst the reindeer in fascination. The baby smiled widely at us and stretched out her hand to show us what she held. Frida took the thing from her hand and the child beamed, very pleased with herself. The thing, it turned out, was a fresh piece of reindeer ear that her grandfather had recently cut off when making his mark on a new calf. Her pocket was full of pieces of ears, and it was only then that I noticed the blood smears on her cheeks and reindeer-leather hat. I am in awe of the actual marking itself. As one thousand reindeer flock around, the Sami single out an individual whose ear is cut in a way that signifies it belongs to them. If it has a calf following it, they cast their lasso and catch it, quickly mark its ear with the same pattern, and then let it return back to its mother. The whole process is so fast-paced, and the fact that they even have time to recognize the mark is incredible. Then again, if you start off at the age of the baby we met, maybe learning to spot your mark is second nature. 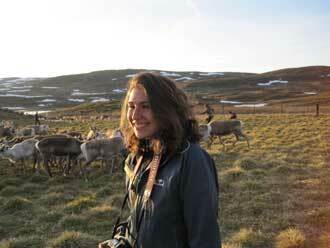 Sophine Johnsson is finishing up her Bachelor’s in the McGill School of Environment. She has spent the past two summers working above the Arctic Circle in Sweden as a field assistant for David Olefeldt, Professor Nigel Roulet’s PhD student. She says she’s been bitten by the arctic bug and will be back.